I wrote about the new Find A Grave website today in Updated Find A Grave Website Adds Decent Source Citations using my ancestor Elizabeth H. (Dill) Smith as the example. 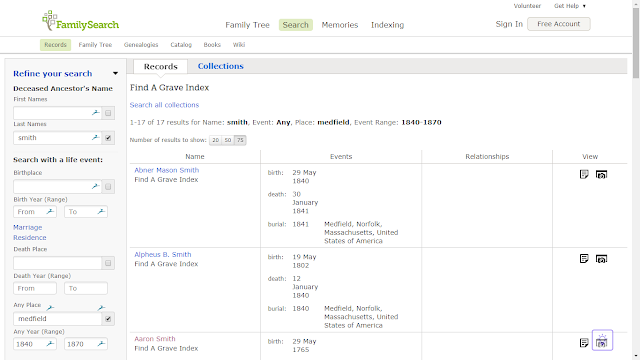 I wanted to compare the Find A Grave source citation with the FamilySearch and other citations, so I searched on FamilySearch for the Find A Grave record collection. 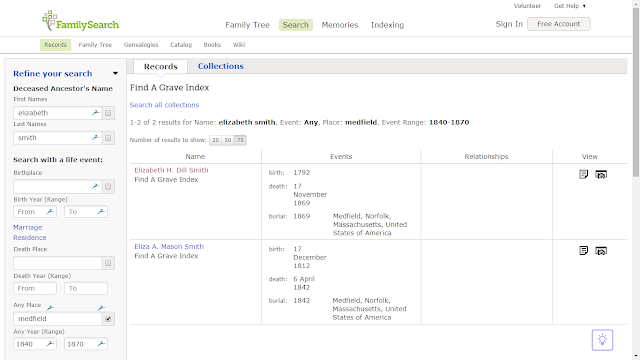 Searching that, I couldn't find Elizabeth Smith's memorial on FamilySearch using exact first and last names, years, etc. Frustrated, I moved on to something else. 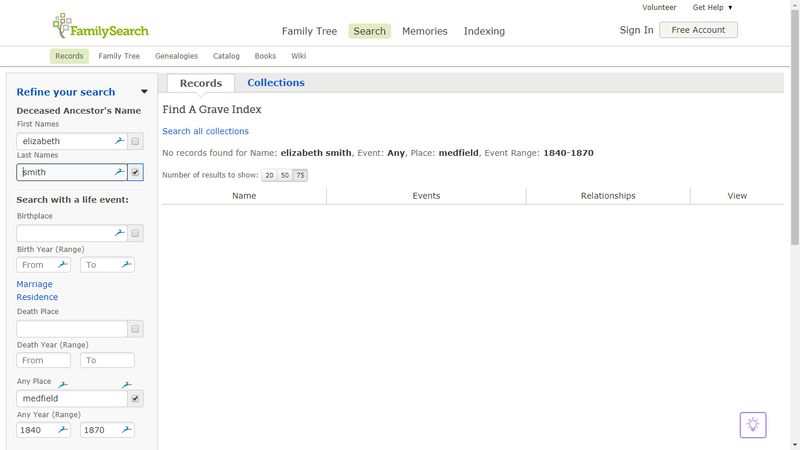 This afternoon, I thought to myself - "it must be there, but perhaps the indexing is quirky." No matches. But I know she's there! 17 Matches, but none were my Elizabeth Smith. I still know she's there! 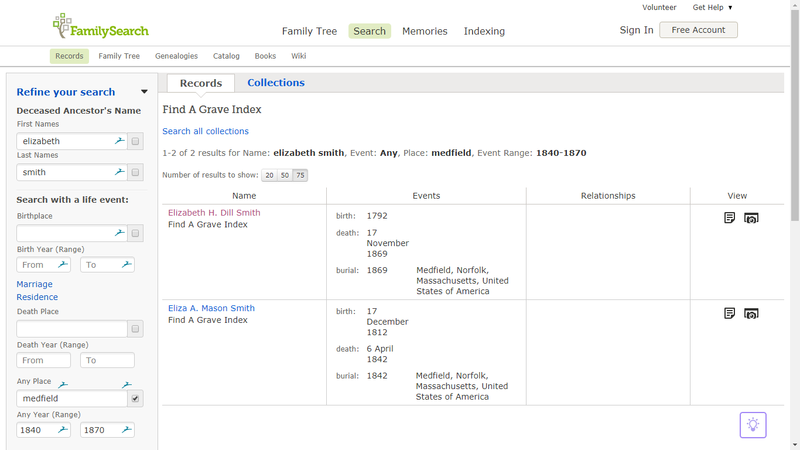 3) I put "elizabeth" back in as a first name, but "not exact," and used "smith" as the last name, but "not exact:"
Yay!! That worked. Why? Obviously, it has to do with the last name that was indexed. 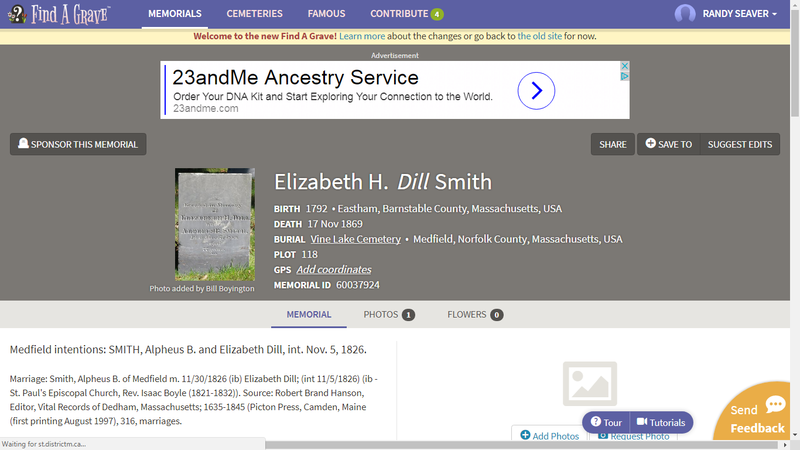 4) What if I used "dill smith" as a last name, and made it "exact?" The first names and last names are not in separate fields. They do have a separate field for the assumed maiden name. 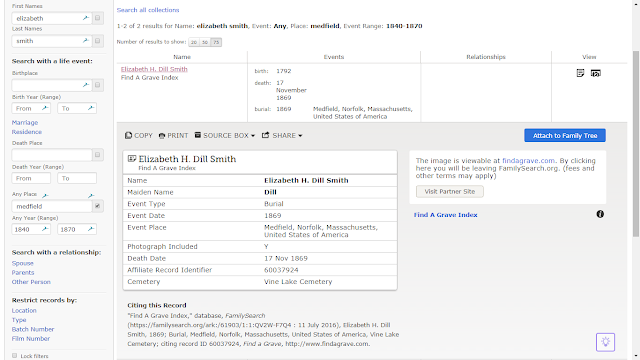 "Find A Grave Index," database, FamilySearch (https://familysearch.org/ark:/61903/1:1:QV2W-F7Q4 : 11 July 2016), Elizabeth H. Dill Smith, 1869; Burial, Medfield, Norfolk, Massachusetts, United States of America, Vine Lake Cemetery; citing record ID 60037924, Find a Grave, http://www.findagrave.com. 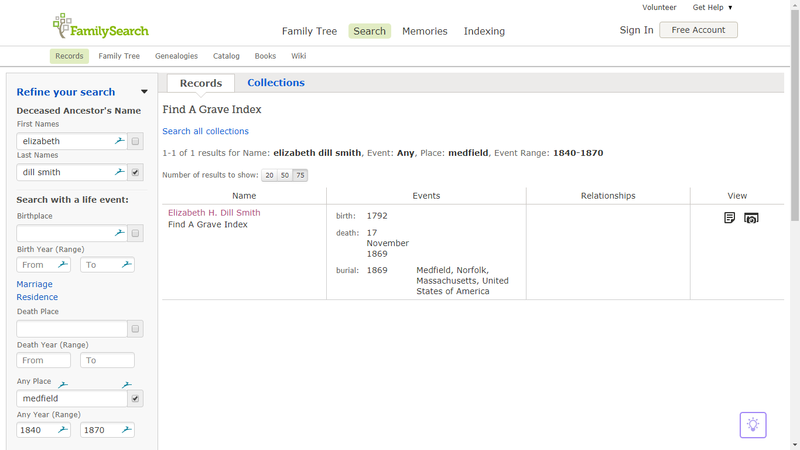 I learned from this exercise that I need to be careful searching in this Find A Grave collection on FamilySearch. I don't know how pervasive this "feature" "quirk" is, but it baffled me for hours today. If it baffles me, it probably baffles many other researchers. 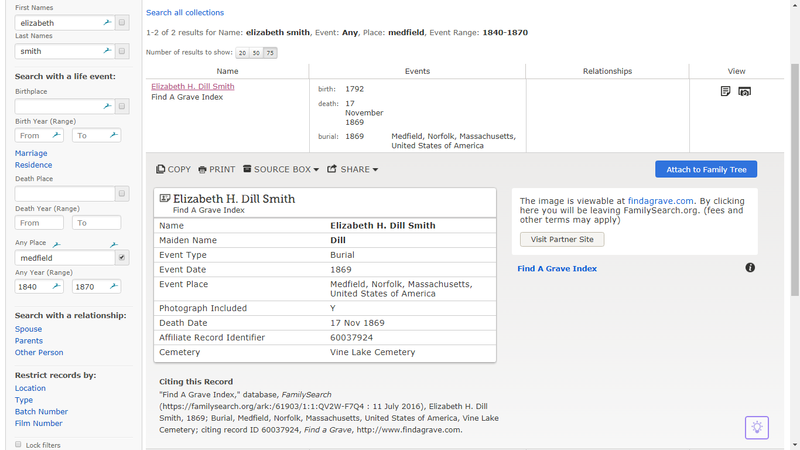 * Users should not use "exact" search for the first and last name fields in this collection on FamilySearch. 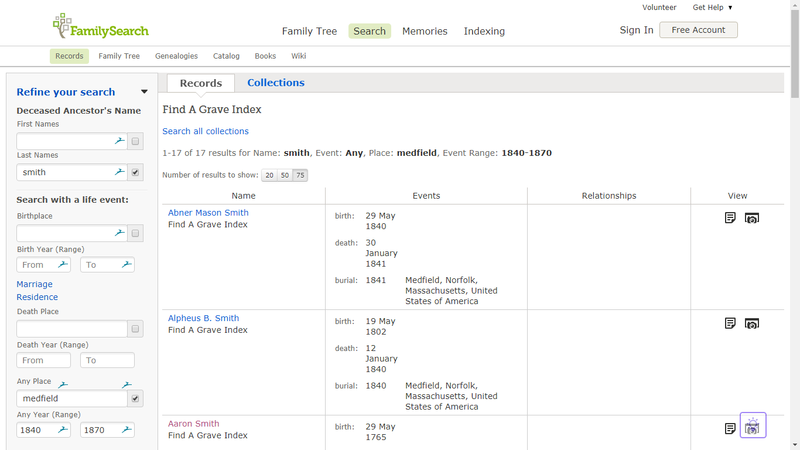 * This may be why Record Matches for Find A Grave don't appear on some FamilySearch Family Tree profiles. That's disturbing news, isn't it, Randy? 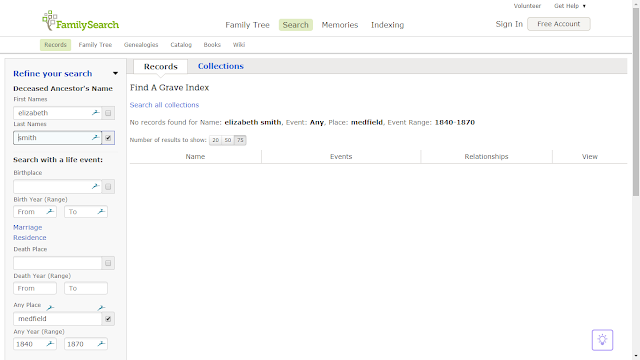 A lot of the time, we're lucky if we know ONE surname for a search, let alone two.